Australian Government expenditure on immigration (not including border protection) in 2019–20 is estimated to be $2.9 billion, representing 0.6 per cent of the Australian Government’s total expenditure. Management of unlawful non-citizens, which includes the onshore immigration detention network as well as spending on irregular maritime arrivals (IMAs) who have been transferred to regional processing centres in Nauru and Papua New Guinea (PNG). This is by far the largest component of immigration expenditure. It currently accounts for around 65 per cent of total immigration expenditure and, despite expected reductions in spending, is still forecast to account for around 57 per cent of expenditure in 2022–23 (see Table 2). Citizenship, visas and migration which includes migration policy for permanent and temporary visas, future planning, visa processing, and citizenship policy and processing. Regional co-operation, and refugee and humanitarian assistance, which includes co-operation with other countries and international organisations on migration and border management, and the provision of visa pathways and settlement assistance to refugees and people who are found to be owed protection in Australia. Total expenditure on immigration is expected to decrease from $3.8 billion in 2018–19 to $2.5 billion in 2022–23 (see Table 1). The key driver of this decrease is an expected reduction in the number of unlawful non-citizens in both onshore detention facilities and offshore processing facilities as people have their claims processed and are moved out of detention facilities—spending on the management of unlawful non-citizens is forecast to decrease by 17 per cent in real terms between 2019–20 and 2022–23. However, past Budget figures suggest that spending in this area may not decrease as rapidly or substantially as forecast. A significant portion of expenditure in this area comes under Program 1.4 IMA Offshore Management, in the Department of Home Affairs. Over the past several years, actual spending in this area has often varied significantly from forecast Budget figures, with anticipated decreases not being realised. In 2018–19, for example, the Budget figure for Program 1.4 was $760 million, but the 2019–20 Budget papers show that actual estimated expenditure was $1.16 billion. In addition, expenditure on citizenship, visas and migration is forecast to decrease by 17 per cent in real terms between 2019–20 and 2022–23. The Budget documents do not provide further information on this; however, it may be due to lower departmental expenditure on permanent residency visa processing, due to the decision to reduce the number of permanent visas granted (see below). Source: Australian Government, Budget measures: Budget Paper No. 1: 2019–20. Note: Figures may not add due to rounding. Source: Australian Government, Budget strategy and outlook: Budget Paper No. 1: 2019–20. Source: Parliamentary Library analysis of figures in Australian Government, Budget strategy and outlook: Budget Paper No. 1: 2019–20. In general, migration and visa policy announcements tend to have modest fiscal effects compared to other portfolio areas. Key drivers of expenditure in immigration are the numbers of people entering Australia on permanent and temporary visas. This year’s Budget does not include an announcement on the size of Australia’s Humanitarian Program. However, previous Government announcements indicate that it will be set at 18,750 places. The number of visas available each year for refugees and other humanitarian entrants under the Humanitarian Program hovered around 13,750 for many years, until it was gradually increased to 16,250 in 2017–18, and 18,750 in 2018–19. This followed a commitment made by the Government in 2014 as a result of negotiations with the Senate cross bench over the passage of the contentious Migration and Maritime Powers Legislation Amendment (Resolving the Asylum Legacy Caseload) Act 2014. 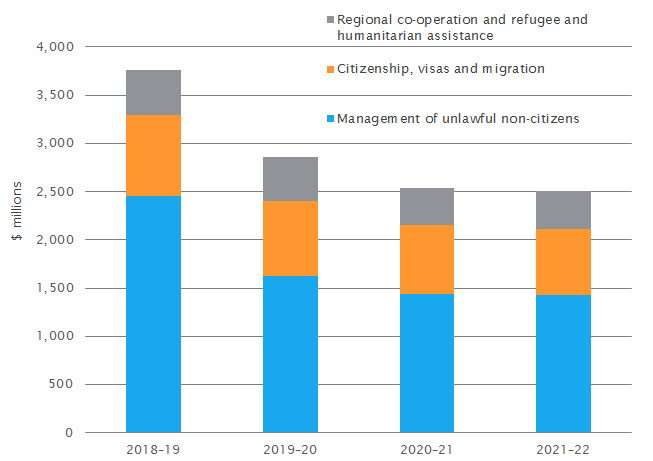 The increased number of humanitarian places was formalised in a Determination made by then Immigration Minister Scott Morrison in December 2014. This Determination did not specify the number of places to be available beyond 2018–19. However, in 2016 then Prime Minster Malcolm Turnbull, in a speech to a Leaders’ Summit on Refugees in New York, stated that Australia’s Humanitarian Program would be maintained at 18,750 places ‘from 2018–19 onwards’. On 20 March 2019, the Morrison Government announced a reduction in the permanent visa migration ceiling from 190,000 to 160,000 and the introduction of two new provisional regional visas. The Migration Program is the collective number of permanent skilled and family visas. While the number of permanent visas available in any one year influences the rate of migration to and from Australia, this figure is not equivalent to the rate of immigration to Australia. There will be 160,000 permanent skilled and family visas available for each of the years in the forward estimates period. This is a change in planning approach, as previously the number of visas was set either one or two years ahead. The Department of Home Affairs has published a breakdown of the various permanent visa categories. In early 2018, the Prime Minister, as the then Treasurer, highlighted the loss of fiscal revenue associated with a reduction in the number of permanent residency visas. However, the 30,000 reduction in permanent visas in this Budget is offset by the estimated increase in net overseas migration and the measure has ‘no further budget impact’ (p.11). Source: Australian Government, Federal financial relations: Budget Paper No. 3: 2019–20, pp. 91–92. Note: The NOM estimates are provided for calendar years in the Budget papers. The NOM estimate in this Budget represents a 17 per cent increase in 2019 compared to the 2018–19 Budget. The rate of NOM has an important role in population growth and, subsequently, aggregate economic growth. Total population growth is projected at 1.7 per cent per year (Budget Paper No. 1, Statement 2, p. 5). As the most recent Australian Bureau of Statistics preliminary estimate of NOM was 240,100 for the 12 months to September 2018, it appears the Budget assumptions are expecting NOM growth in the coming years. There is no additional information in relation to what categories of migration are driving this expected increase in net migration. Given the permanent visa reduction, it is likely that the increase assumes some combination of more new migrants holding temporary visas, including international students and temporary skilled workers, as well as a potential reduction in the number of people (citizens and migrants) leaving Australia. Source: Australian Government, Budget measures: Budget Paper No. 2: 2019–20. Note: Revenue, expenditure and related capital for these measures is often cross-portfolio. The Budget provides $185.1 million over two years, commencing in 2018–19, for Regional Processing Arrangements–Christmas Island. The bulk of this ($178.9 million) is to manage the transfer of IMAs from Nauru and PNG to Christmas Island for medical treatment. This measure follows the passage in February 2019 of the Home Affairs Legislation Amendment (Miscellaneous Measures) Act 2019, which provides for the medical evacuation to Australia of asylum seekers and refugees in Nauru and PNG who require urgent medical treatment. The Government announced that it would reopen the Christmas Island immigration detention centre to house the expected large numbers of arrivals of people medically evacuated from offshore processing countries. It indicated at the time that this was expected to cost around $1.4 billion over the forward estimates. This Budget measure provides for a much smaller amount of spending, because it is based on the Government’s commitment to repealing the Act and closing the Christmas Island detention centre. Spending in this area will therefore be dependent on the Government’s ability to win support in the Senate for the repeal of the legislation. Actual spending will also likely be determined by the number of people transferred to Australia under the provisions of the legislation. The costings regarding the reopening of the Christmas Island detention centre were reportedly based on an assumption that 1,000 people would be transferred. The Department of Home Affairs confirmed in Senate Estimates on 4 April that to date, only one person has been transferred to Australia under the new process, and that person was not taken to Christmas Island. $39.5 million is provided for the Regional Cooperation Arrangement (RCA) in Indonesia in 2019–20. The RCA supports countries in the region in managing asylum seekers in their country. Australia has funded initiatives under the RCA since it was agreed in 2000. There is no fiscal effect listed for the 30,000 reduction of permanent skilled and family visas, for the Migration Program–Reducing the planning level. This is due to an increase in the estimate of net overseas migration. For 2019–20, there will be 108,682 skilled visas, 47,732 family visas and 3,586 child and special eligibility visas for a total of 160,000 permanent visas (Budget Paper No. 2, p.11). Compared to the nominal composition under the previous ceiling of 190,000, these are reductions of 19,868 skilled visas, 9,668 family visas and 464 child and special eligibility visas. There are several possible consequences of this reduction. The Government has argued that this will reduce congestion in urban areas; however, with the overall increase in the rate of net migration it is unclear what extent the reduction in permanent visas will have on the overall rate of migration. In addition, there are increasing numbers of people waiting for permanent visas. For example, there were 80,539 pending applications for partner visas as at 30 June 2018 (p. 16). It is possible the reduction in visas will further extend waiting periods if demand for permanent visas outstrips the new, reduced allocation. The Budget provides $49.6m over five years commencing in 2018–19 for New Regional Visas–Population Package. This measure introduces two new three-year provisional visas from November 2019 targeted at regional Australia (defined as outside Sydney, Melbourne, Brisbane, Perth and the Gold Coast). The visas—Skilled Work Regional (Provisional) and Skilled Employer Sponsored Regional (Provisional)—replace the existing Regional Sponsored Migration Scheme (subclass 187) and Skilled Regional (Provisional) (subclass 489). The two new visas will account for 14,000 places. A provisional visa is a precursor to a permanent visa, where a number of eligibility criteria must be met at the end of the provisional period. In contrast, other skilled permanent visas such as the Employer Nomination Scheme (subclass 186) and the Skilled Independent (subclass 189) visas are permanent visas which do not require a provisional precursor. Both regional visas being abolished are also permanent visas. It is unclear whether the change from permanent to provisional visas for regional areas will have potential effects on people choosing to apply for regional visas. Better Distribution of Medical Practitioners package. This saving is predominantly generated from lower Medicare and Pharmaceutical Benefits Scheme payments due to 155 fewer overseas trained doctors being granted permanent visas. A Department of Health factsheet states that in some areas, ‘growth in medical services is due to an increase in the number of doctors, rather than genuine increases in patient need for services’ and notes that overseas trained doctors have increasingly been working in metropolitan areas rather than areas of shortage. As growth in the pool of new overseas trained doctors slows, Medicare expenses in the form of rebates, derived from medical appointments and other services, is also expected to fall. This measure is an extension of a similar measure from the 2018–19 Budget. There is a $71.0m saving over five years in the Department of Home Affairs Portfolio Budget Statement in relation to ‘specific aspects’ of previously announced Immigration Reform expenditure and capital measures which are now not proceeding. The ‘specific aspects’ of the Immigration Reform program not being progressed are not outlined. Immigration Reform is the name given to the procurement process for a market-based service provider to engage with the design and delivery of visa processing systems. The Immigration Reform package began in the 2017–18 Budget and was followed by IT upgrades announced in the 2018–19 Budget. In MYEFO 2018–19, additional funding of $72.3m was provided (expenditure and capital). The Opposition has signalled concerns with the Immigration Reform measure. The procurement process is not planned to be finalised prior to the 2019 election. For a discussion of border protection see separate Law enforcement and security overview brief.
. Estimates of real fiscal growth rates are based on 2018–19 dollars with the consumer price index as the deflator, and have been calculated by the Parliamentary Library.
. The program was temporarily increased to 20,000 places under the Labor Government in 2012–13, and was supplemented by an additional 12,000 places for refugees from Iraq and Syria granted in 2015–16 and 2016–17. See J Phillips, Australia’s Humanitarian Program: a quick guide to the statistics since 1947, Research paper series, 2016–17, Parliamentary Library, Canberra, 2017. A person is counted as an addition to the population if they are in Australia for 12 of the previous 16 months and likewise, are excluded from the population if they are not in Australia for 12 of the previous 16 months. See ABS Demography for more information.